Fire safety education in an engaging storybook in English and Spanish. In addition to the lesson that matches and lighters are adult tools only, the story is a gentle reminder that picking up clutter and keeping pathways clear is a good safety technique for all emergency preparedness. Illustrations reinforce the message that every home should have smoke alarms. Includes questions for kids, and extra safety information for parents. FEMA recognized the importance of this book with an Assistance to Firefighters grant that printed more than 140,000 copies of Mikey Makes a Mess, distributed through hundreds of schools and day care programs, fire departments, libraries and community agencies nationwide. Prevention 1st, a non-profit agency dedicated to injury prevention, includes Mikey Makes a Mess in many of its programs including After the Fire: The Teachable Moment. 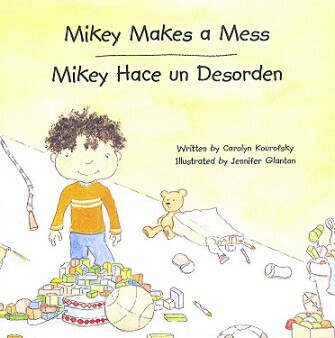 It also hosts an online edition of Mikey Makes a Mess with turnable pages, narrated in English and Spanish.